Designed for small groups of 12 or more, this tour is guided in English and covers a great deal of the island, making significant stops throughout the day. After a breathtaking drive up the side of the mountains and on narrow, twisting roads, we will reach our first stop, the village of Dio Choria, noted for its fortified style of architecture and three natural springs. Next will be a visit to the famous Monastery of Kechrovounie, with its elegant bell tower, 10th Century Icons, and fortified layout and architecture. The tour will then stop at the ancient Venetian fortifications of Exobourgo, where you can take the twenty-minute climb to the top. This is a photographic dream for wide-angle lenses, and on a clear day, you can see as far as Santorini. Our drive continues on to the village of Loutra, where we will have an opportunity to visit the Jesuit Folklore Museum, housing a collection of wonderful artefacts depicting life and work on Tinos for the past few centuries. In the same small village, we will visit the Ursuline Convent, which has been fully restored and depicts life at the private school since its inception in 1862. Following a stop at the old village of Volax, with its marvelous architecture and the old basket weavers, we continue on through some of the most beautiful countryside, dotted with endless rock walls and beautiful white dovecotes. Passing through the main growing region of Tinos, the tour will continue to the beach of Kolimbithra where we will stop for lunch and swimming. 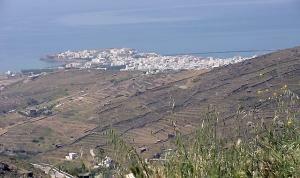 About two and one-half hours later, we will continue toward Pirgos, the largest village on the island. The route will include driving through wide, undeveloped expanses of countryside. In Pirgos, we will visit numerous marble workshops, see some beautiful marble carvings at the village cemetery, and stroll through the town to see its architecture and marble pavements. There will be enough time to take a coffee in the main square and visit the new Pirgos Museum of Marble Crafts. Returning toward Tinos Town, there will be a stop at the village of Kardiani to admire this village built amphitheatrically on the hillside, with its central square and “frog” fountain, surrounded by trees and vegetation kept green year-round. Finally, there will be a stop at the Valley of the Dovecotes, with ample opportunity for photos. Notes: Group Basis or Private Tour only. Each car requires a licensed driver. Modest clothing required for the Monastery visit; long trousers for men; skirts or slacks for women.